COLFAX, Wash. -- Bill Myers took a different direction two years ago when he wanted to expand his wheat operation. Under his Joseph's Grainery label, Myers decided to direct-market his wheat, flour and other products. "None of this is rocket science and there's no great big secrets here," Myers said about selling his wheat directly to customers. "It's just a lot of hard work." He offers 3-pound bags of grain, 2-pound bags of flour and bulk packaging. His other products include pancake mix, cookie mix and a cracked wheat cereal. Myers sees the endeavor as exploring the roles of middlemen. "Everybody that does all of these jobs from one end to the other is making money," he said. "We just thought we'd see what's in it all the way along." The products are milled in a small facility near Steptoe, Wash.
Myers uses chemicals before the wheat starts to develop heads. But he uses smaller bins for storage, which means he does not have to treat it during winter storage, he said. "We can sell a natural product," he said. "The minute you eat any of this stuff, you'll notice a marked difference because it's got everything in it. It's a high-quality alternative to organic." The company initially bagged its wheat, barley and lentils, but some customers weren't sure how to mill them, Myers said. On the Joseph's Grainery website, his daughter Kelli now demonstrates how to mill wheat in a blender and offers recipes. Milling the grain effectively doubled sales, Myers said. A lifelong farmer, Myers estimates he is selling 1 to 2 percent of the crop from his 3,200-acre operation through the business. He got the idea in 2008, a time of high wheat prices, as he looked to expand his operation and found available land hard to come by. Myers said his customer base is the small-scale user. "My proteins will be all over the board, and would maybe drive some of these people crazy," he said. "But for Mama at home who's baking, she doesn't care, as long as it makes a good loaf of bread for her." Edward Brown is general manager of Pilgrim's Market in Coeur d'Alene, Idaho, one of the locations selling Joseph's Grainery products. Brown would like to see more businesses embrace a model that encourages a direct relationship with farmers. "People are willing to pay a premium for knowing their farmer and how they grow their food," he said. Customer response is growing, Myers said. 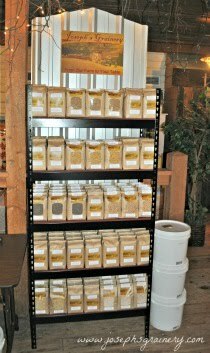 Joseph's Grainery products are available online and in about 15 grocery stores around the region. "This is a little specialized thing I think is striking a chord with a lot of people," he said. Right now, the income helps to pay part of the electricity bill or helps with labor costs. Myers said he would like to expand to the point that he can direct market his entire crop. Myers said his intention is not to compete with the large, international labels. "I'm just trying to see what I can handle and what I can't handle," he said. "Right now, it's kind of a glorified hobby, but I'm looking forward to the day when things get out of hand." Myers purposely misspelled "granary" to reach out to the public. "I got called on it once or twice," he said with a grin. The business gets its name from Myers' father and grandson, as well as Myers' middle name. It also pays tribute to Joseph of the Old Testament.